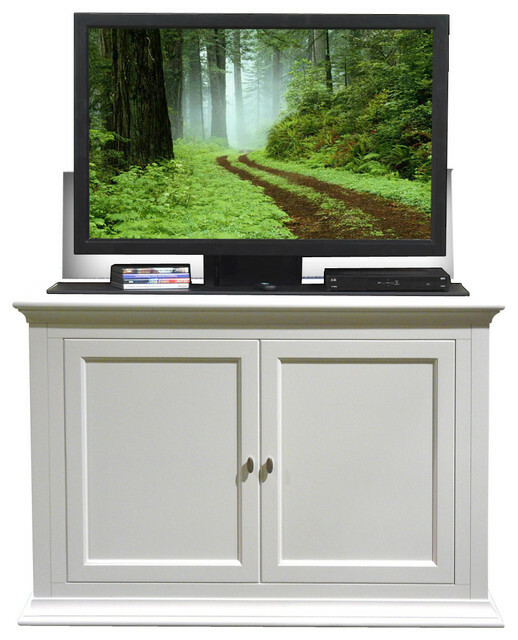 One of the latest trends we’ve seen in the last few years we’ve seen rising in homes are pop-up flat screen cabinets. I’m sure you’ve seen one of these set-ups on design shows or in James Bond movies. As you can imagine, you can choose from any style or finish material, the limit is really your imagination. The big decision you have to make in regards to a pop-up flat screen cabinet is where do you want to put it, what colour/finish would you like and what size do you need. Most homes have areas that are more popular than others as to where the family gathers. One of the most popular places to put a pop-up flat screen cabinet is in the kitchen. The kitchen is guaranteed one of the most popular places to put one of these cabinets since it’s a hub of activity for most families. Of course livingrooms and family rooms are a great place but you might also have to consider, do I want this cabinet against the wall and a focal point or you might be daring enough to place a cabinet in the centre of the room. With your pop-up flat screen in the centre of the room, it can act as a room divider or sit behind a couch where you’d normally place a console table. We’ve seen a lot of pop-up flat screens in bedrooms. What better relaxing place to have a flat screen than in your bedroom. There are a variety of suggestions for placing that cabinet. Either place them traditionally against the wall or as we have suggested, use them as a room divider. The most unique placement for your pop-up flat screen is at the end of your bed either in a cabinet infront of your bed or as part of the bed frame itself. Of course where you place the cabinet will determine what size of a cabinet you want. As well, the size of your flat screen limits where you can place your cabinet as well. Now that you have decided where to put your pop-up flat screen cabinet, we should mention about the care of your flat screen flat screen. Hopefully your cabinet maker is well aware of a few constraints when designing your pop-up flat screen cabinet. Keep in mind, the glass on your flat screen flat screen can be easily scratched. I use isoprophyl alcohol is one the best cleaners for your screen. Never use anything that has an ethyl or methyl or keytone-like cleaner since they damage your coating on your flat screen. Something else to keep in mind is that your flat screen is highly-sensitive to fluctuations in temperature and humidity. Consistency is always best in regards to temperature and humidity in your cabinetry.